Holland has so much to offer for the traveller looking to make the most of their holidays. We've come up with some suggestions on what to see or do over the hotter months of 2013. Time is trickling away for you to visit Alkmaar's renowned cheese market. The market is open over the summer months from April to September. 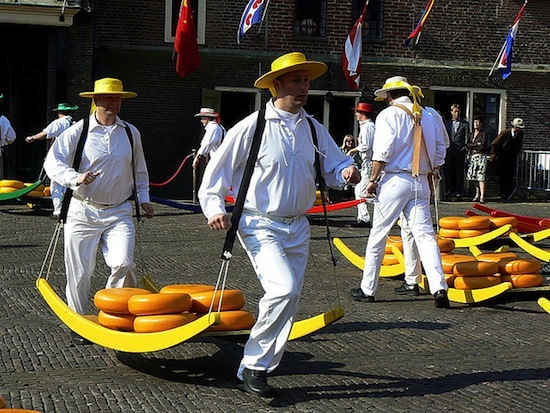 From 10AM every Friday you can watch Holland's traditional cheese trading take place in Alkmaar. The cheese market is held in the Waagplein or 'Weighing square' and has been a part of life in Alkmaar reportedly since 1365. If you want to go shopping for the very best cheese to be had then this market is for you. Up to 30,000 kilograms of cheese is laid out in the morning and checked over by market masters and traders to ensure everything is up to standard. Which is vital since with over 2000 different types of cheese available, order needs to be maintained so that you can find what you're looking for. The cheese market is a vibrant industry in Alkmaar, the 'placers', 'throwers' and 'scale masters' make it a show as much as a market. The long history of this event means there is much ceremony and tradition behind the goings on so you can take tours to learn a little more about it. The last cheese market of the year is being held on the 6th September 2013 so if you don't want to miss out, get over to Holland this summer. If you want your family holiday to offer a little more than cheese shopping, stick around in Holland for the second weekend of September and 'Open Monumentendag' or Heritage Days. Around 4,000 historical buildings and sites are opened to the public free of charge. The hardest part of your stay will be choosing between which parts of Holland to see. Open Monumententag is a wide spread effort across the entire country to encourage awareness about Heritage sites. Essentially functioning as a big PR day for the historical foundation of the country. From fortifications to churches and medieval castles, you'll be able to see whatever best sparks your interest with no entry fee whatsoever. This is a major cultural event for the Dutch, so expect things to get a bit busy at the more popular locations. You could always do a little research and go and see something a little out of the way. Many of the sites have arranged tours and activities especially for the kids. Heritage days are about fun and learning, what better way to spend your summer? If you go on holiday for a bit of indulgence then Maastricht will definitely be of interest. It has a natural beauty all of it's own surrounded by hills which are an infrequent occurrence in the traditionally flat Dutch landscape. It is also one of the oldest cities in Holland and has therefore gathered an intriguing history and collection of churches, monuments and districts of important cultural significance. In our experience, with a long traditional history comes a fantastic range of culinary choice. 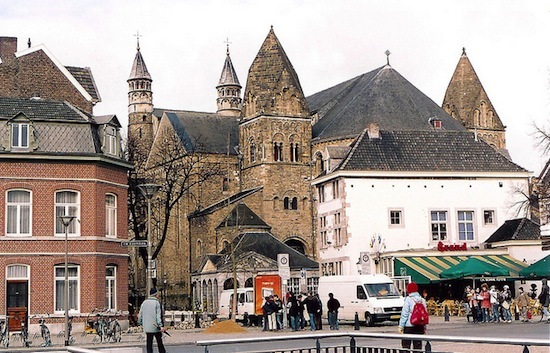 Maastricht is littered with a fantastic cross section of restaurants and small eateries. The entire city can be seen by foot, so you can take in the city's architectural splendour as you digest a wholesome meal. It's because of the well-evolved gastronomy in Maastricht that Preuvenmint is held there towards the end of August. Preuvenmint is a four day food festival that takes place on Vrijthof Square from 22nd-25th August. The name 'preuve' (to taste) and 'evenimint' (event) pretty much sum it up. Up to 30 stands will be erected, with cuisine from some of Maastricht's finest restaurants allowing you to taste gourmet in the Dutch style. All the proceeds of the event are donated to a good cause and once you've eaten your fill live music is performed on an open stage for the people of Maastricht to gather and have a sing along. If you quickly tire of city tourism, gastronomy and historical heritage, then you're certainly hard to please but if you'd prefer, the beaches of Holland are readily available for you to languish on. The best source for beach information is Holland's tourist website, which you can find here. We've summarised it for your easy digestion in this blog. The three main beach areas of Holland are the Wadden Islands, the Zeeland coast and the coastlines of North-Holland and South-Holland. Beach areas in Holland are best seen by bike, they all have cycling paths so you can enjoy the cool sea air. There's a sprinkling of things to see and do beside the sea including museums, galleries, animal parks and harbours where you can catch a boat ride. The Zeeland coast is an ideal spot for beach lovers, it has resorts for you stay in and plenty of beachfront cafes. It also gets more hours of sunlight than anywhere else in the Netherlands. There are some fascinating sights there too, Zeeland is home to the first lighthouse based on revolving mirrors. It also has the longest work of art in Europe in the shape of a series of neoclassical columns 3608ft long along the De Weielingen promenade in Cadzand. As we've mentioned in other posts, Holland has a well developed culinary taste for fish, namely herring, and is one of the main exporters of mussels. A holiday along the coast is sure to expose you to some fantastic seafood. If you cannot get over to Maastricht for the food festival, a tour of coastal towns and their cuisine is a damn fine alternative. Holland was one of Britain's major rivals when it came to sea power, it boasts a maritime history as grand as our own and time spent by the sea is sure to expose you to some of that. Though the major museums are found within the cities, the Deltapark Neeltje Jans water theme park is one the best places to to learn a thing or two about the Dutch navy. It provides a fun environment complete with simulators, seal shows, boat rides and a water playground. If the days aren't quite bright enough for you to spend them laying on the sand then a water park is definitely the next best thing. Time is running thin for you to enjoy summer in Holland, take a P&O ferry to Zeebrugge to get there.